1. Installation steps depend on what color scheme you have chosen. 1.1 If you have chosen Green color scheme upload files to your ftp server using any FTP software which you have installed on your computer. 1.2 If you have chosen Orange or Blue color scheme upload files to your ftp server using any FTP software which you have installed on your computer. 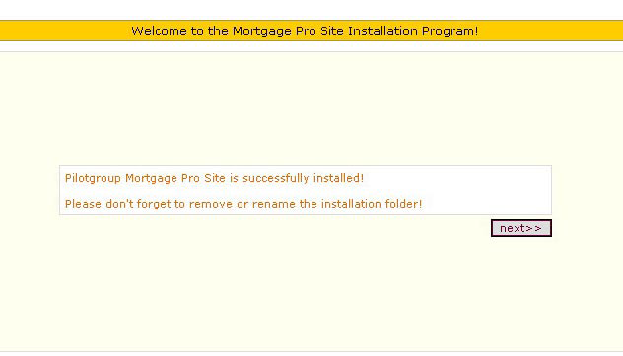 Download and unzip src_mortgage_color_themex.zip (where x is the color) and replace the files with folder templates/pilot_3_theme to the ones you received. 2. Create empty MySQL database and add a user to this database. Database user should have all the rights because our script will use this user’s parameters to populate the database with needed tables and data. Note2: If you use Windows server, then you should either yourself give all rights to Internet Guest account for the above-mentioned folder or ask your hosting company to do it. 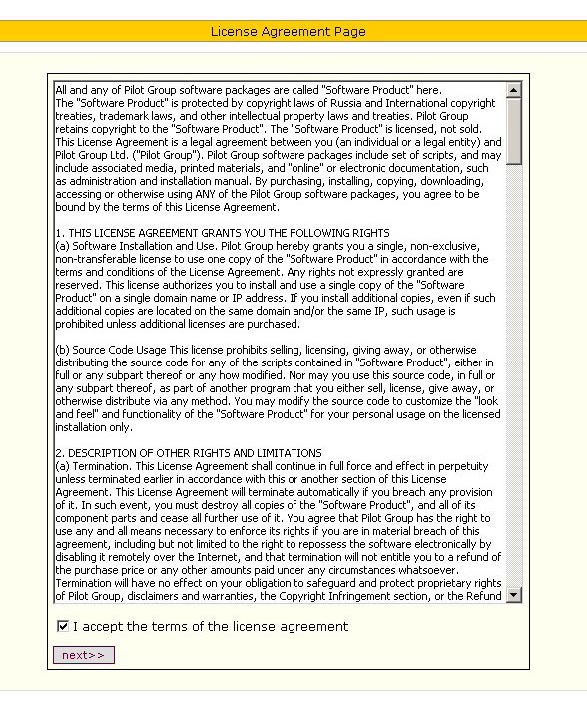 Before installation you should read carefully License Agreement, tick “Next” button if you agree and continue software installation. Step 1 – Check up permissions. Please check if you have granter all necessary files and folders with CHMOD 777 permissions. 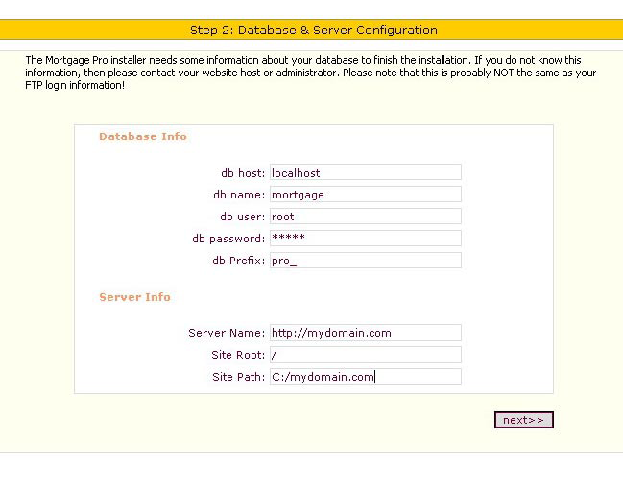 Step 2 – Database and server Configuration. Here you should enter settings,necessary for MySQL database connection. 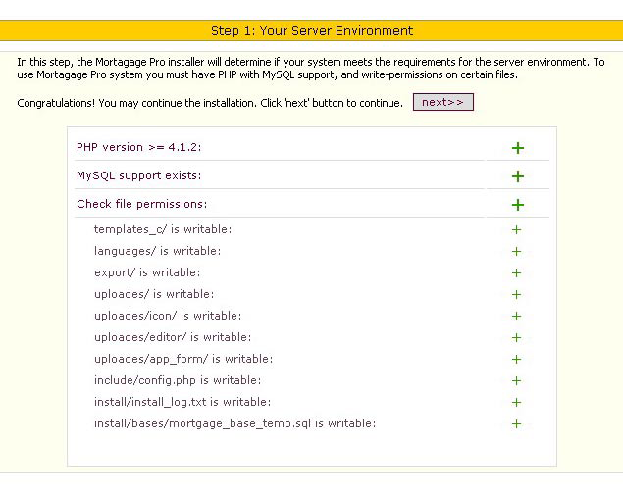 MySQL database should be created at your server prior to Mortgage Software installation. Specify your domain name and site root there too. 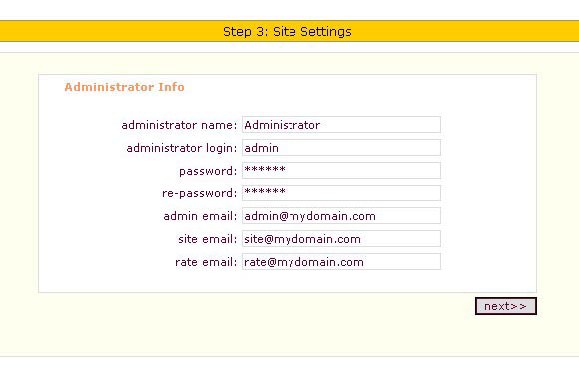 Step 3 – Administrator’s information. Here you should specify your administrator site access data, your email address, contact email and email address that will be used for Rate watch newsletters. 5. Please, remove or rename the installation folder! It’s name is “Install”. The new name of the folder should exclude “install” word.